If you are providing services to a customer based overseas, we can provide you with the support you need and additional invoicing features to make light work of exchange rates. If you have a client based overseas, inniAccounts will provide the extra support you need with your invoicing, taxes and accounts. Your invoicing and bookkeeping features will be extended to assist and handle any exchange rate conversions. Additional support when you are providing services (we don’t support goods at the moment) to customers based overseas is available upon request and subject to an additional fee. Please contact your account manager for further details. Behind the scenes your online software will account for exchange rate gains and losses as well as ensure your VAT return is completed correctly. Just as invoicing clients based in the UK is made easy by setting up a contract, you will do the same for your clients based overseas but with some additional information. You can read more about the additional information and an important check on your clients VAT registration in this article. When entering expenses into inniAccounts you should record the amount in pounds. When you add billable expenses to your invoice they will be converted into the client’s currency. When you create an overseas invoice in inniAccounts you are prompted to select both the currency and the country of supply. If you are creating an invoice for a pre-defined client/contract (see above), the currency and country will default to the options you selected when setting up the client/contract. Select the currency you wish to invoice your client in – for example, Euros or US Dollars. For invoicing purposes the country of supply is the country into which you will be supplying services. For example, if you are invoicing a client who is based in France the country of supply will be France, regardless of where you are based when providing the service. The country of supply is used by the software when creating your VAT return. You can add time, expenses and mileage to your invoice in the same manner you would for UK-based clients. Billable mileage and time will be added to your invoice using the rates specified in your contract settings. When adding a billable expense the value is converted to the invoice currency using the appropriate exchange rate. If required you can edit the invoice line and change the recharge value of expenses to match the amount (in the local currency) shown on your expense receipts. Once you’ve saved your invoice inniAccounts will convert the invoice amount into pounds using the exchange rate on the invoice date. This value will appear in your homepage, in bookkeeping as a pending payment in LiveCash. The exchange rate is shown when you view the invoice. Once your client pays the invoice you’ll need to confirm exactly how much money you’ve received. The actual amount you’ll receive into your bank account in pounds will vary due to exchange rate fluctuations and bank fees. inniAccounts makes it straight forward to account for these variations. If you open a non sterling bank account, we’ll set it up in inniAccounts for you. It allows you to reconcile your account as normal using up to date exchange rates. If the invoice has been paid in full by your client, simple leave the ‘fully paid’ checkbox checked. In the ‘amount (£)’ box, enter the actual amount received into your bank account in pounds – this will most likely be different to the default value shown in the box. This amount should match the figure shown on your business bank account. If, on the other hand, the invoice has been partially paid you’ll need to record both how much of the invoice has been paid in the foreign currency and the amount received in pounds. Consider the following example: you have raised an invoice for €2,362.24 and the client has paid €1,000 of the invoice balance. After looking at your bank statement you can see that £852.72 has been received into your business bank account. In this instance, confirm the pending payment and enter £852.72 into the ‘amount (£)’ box. Uncheck the ‘fully paid’ checkbox, enter €1,000 into the ‘amount (€)’ box and save the transaction. Once you receive the balance of the invoice, simply confirm the remaining pending payment. Once again enter the amount shown on your business bank account, check the ‘fully paid’ checkbox and save the transaction. If you’re VAT-registered in the UK and supply services to VAT-registered customers in another EU country, you’ll need to tell HMRC about those supplies using a EC Sales List. I have a limited company, although I am currently personally working via a UK based agency in Holland. for a Dutch company. My wages are paid in Euros into Dutch bank account and pay personal Dutch taxes on them. The UK agency has agreed to pay my limited company a compensation fee in Euros, With Ininaccounts would I be able to raise an invoice to a UK based company in Euros, and track it being paid in sterling into my Company account? 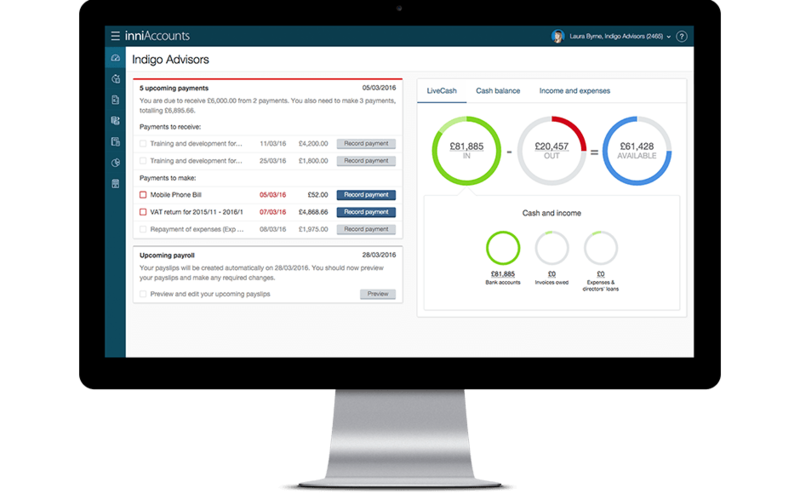 You are able to raise invoices to UK companies in currencies other than £ Sterling using our online accounting application. When you create an invoice in a currency other than £ Sterling, our application automatically looks up the current exchange rate for that currency. This means when you view all your invoicing summary you will see not only the value of the invoice in the currency applied to the invoice, but also the GBP value based on current exchange rates. Once you have received the payment of an invoice, it is easy to confirm the payment to help you track and also confirm the actual amount received in £ Sterling. This allows you to keep track of invoices that are fully or only part paid so you know exactly where you are with overdue payments. I have a company in Panama and I work with France. Can InniAccounts charge my french clients in my place and transfer me the payments in Panama? No, unfortunately we do not offer this service. Fluctuations in the exchange rate may mean that you want to invoice in pounds to ensure that you receive the actual amount invoiced however it would be worth speaking with your client before deciding which currency to invoice in. Hi, I need to make an invoice for a customer in the UK, and I’m from Argentina. Do you offer that kind of service? If you have a UK Limited Company we can help. Our bespoke software allows you to raise invoices in GBP or EURO’s. Please get in touch if you would like any further information or to appoint us as our company’s accountant.